Film festivals are a great opportunity for industry players to introduce their latest film project. It’s also a great way for up and upcoming film makers to put their name on the map. Preparing short and feature films for these showcases is a truly life-consuming effort that filmmakers undergo. Isn’t it only fair that film festival organizers ensure that they offer the best possible ticketing software to get attendees into these films? That’s where film festival ticketing software comes in. 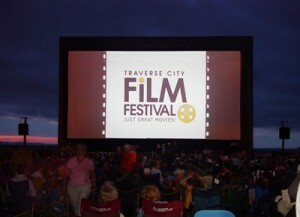 However, finding the right software for film festival ticketing can be very expensive. It can also be very time consuming to get up and running, especially if you’re not prepared. With Event Espresso, and the power of WordPress you can have your film festival ticketing set up in just a few minutes. Event Espresso is a great option for film festival ticketing software, because we offer many of the high-dollar features of larger ticketing platforms at a fraction of the cost. Not only do we offer huge cost savings, we give our film festival users autonomy and flexibility by keeping everything, such as registration and payment data, right on your own website. Early-bird ticketing, special ticket packages, and streamlined checkout, all contribute to making your film festival a profitable event – but only if you choose the right ticketing software! Multi Day Access Passes – Fans love the opportunity to meet their favorite actor/actress when attending film festivals. That’s why offering high dollar (“everything included”), multi-day access passes for your attendees is a must when planning your film festival. With Event Espresso, adding multi-day passes to your film festival ticketing options is fairly simple. Once you’ve created all of the date/times for your events, just create an ancillary ticket for the multi-day pass that includes all of the datetimes for your events. It’s that easy! Multi-tiered ticket pricing – Set up several different types of tickets within reserved or GA sections, and set the price for each. Change prices on the fly – Adjust pricing and availability in real time based on ticket sales activity or other considerations. Early bird ticketing – Automatically schedule price increases (early-bird pricing) at specified dates and times, and control the availability of ticket products with scheduled on-sale and off-sale dates. Fully customizable fee structure – You choose how to treat fees – pass them through to customers, absorb them into your ticket price, or mark them up to cover other costs. Fees are customizable per sales channel, on a per-product basis. 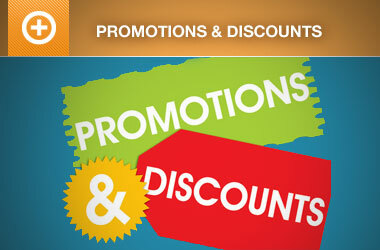 Sales tax – You choose how to treat tax, and specify the rate at which tax should be collected. Print at home tickets – Probably the most convenient way for attendees to receive their tickets. 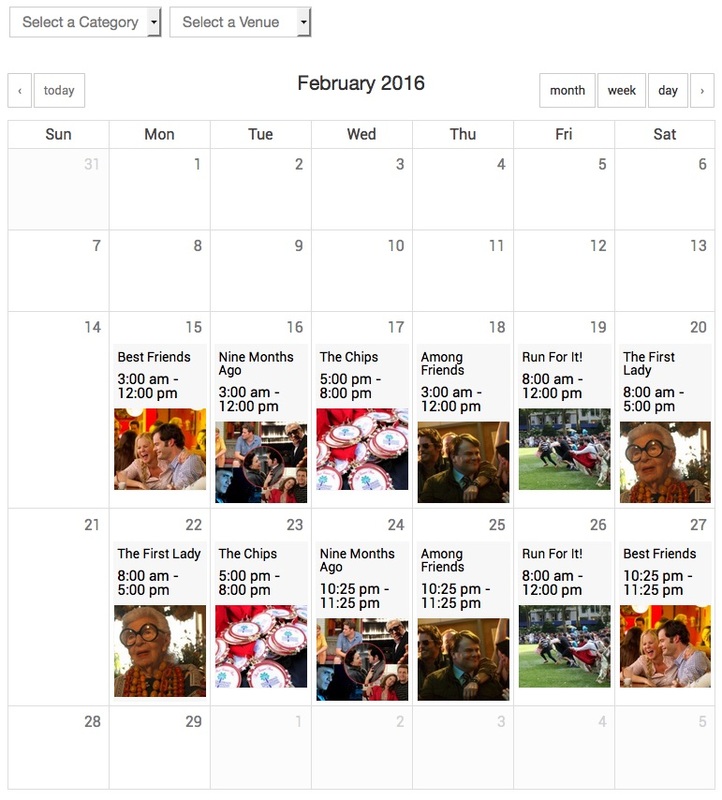 The Events Calendar add-on for Event Espresso allows you to display your film festival dates in a way that your customers are familiar with. The events calendar makes it easy for your customers to find the events and to add your events to their own calendars so they don’t forget! 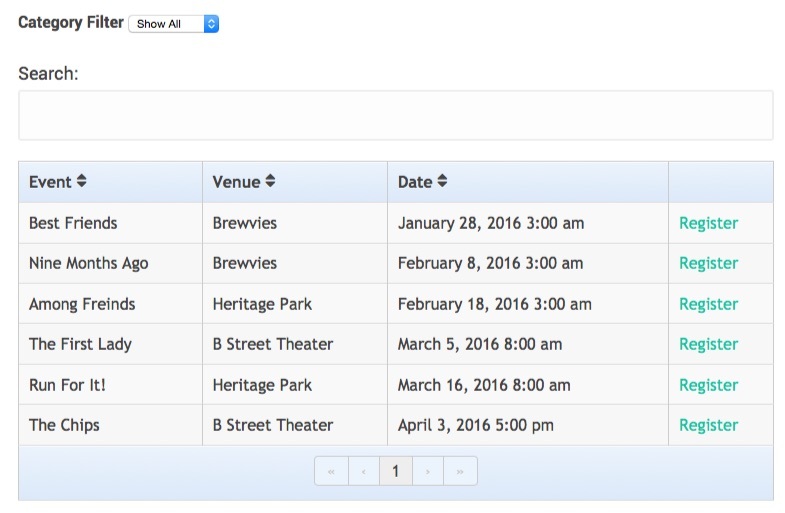 Displaying your events in a table view is one of our favorites for showing a list of movies, venues, and related datetimes. 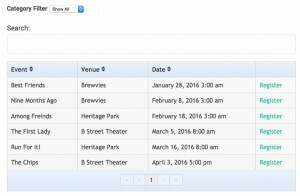 The Events Table Template add-on provides you with an easy to use system that allows you to change the look and feel of your upcoming show times. It comes with a simple table template with category filters, table search, table paging, and more. The Event Espresso Grid View template is great way to display pictures of your upcoming shows in a grid like structure of movie posters that link directly to each individual show time. What’s nice about the grid view template, is the grid dynamically conforms to the width of the page. For example, if your page width is somewhat small, then the grid view may only show two columns, whereas a larger page width will show 3 or 4 columns, automatically. 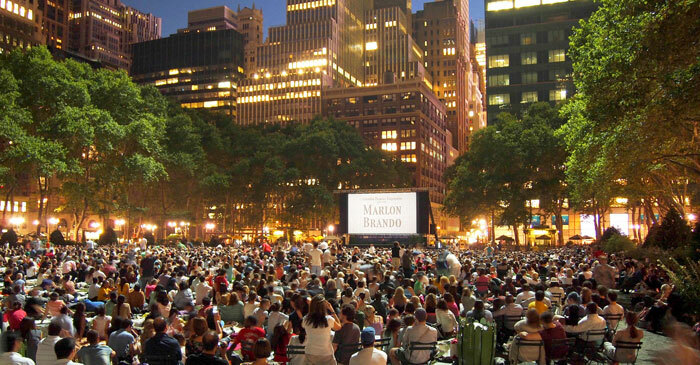 Selling tickets and getting people to your film festival has never been easier. However, getting the word out (marketing your event) can sometimes be a major pain. 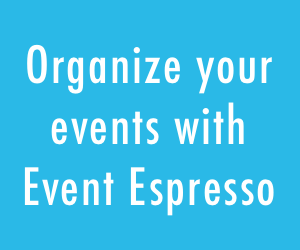 Event Espresso is a great system for your film festival ticketing software, as it has many tools available to help you get the word out about your film festival events. Don’t waste time printing out excel sheets, verifying payments, and crossing off names as attendees show up at the gates. You’ll look like a big shot organizer with ticketing and scanning features available right from your film festival website. Create sweet looking tickets that can be printed at home using the Event Espresso Ticketing add-on. Add as many, or as few details to the ticket as you need/want. Such as dietary needs, special requests, or anything you can think of, really. Tickets can be used any number of ways, as we’ll discuss below. 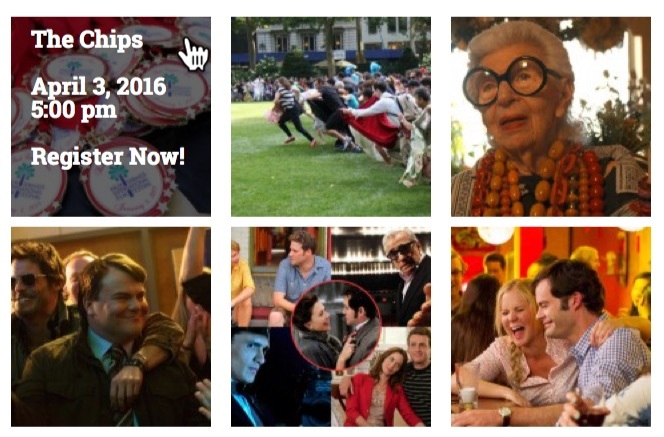 Mailing lists are great way to follow-up with your film festival attendees. 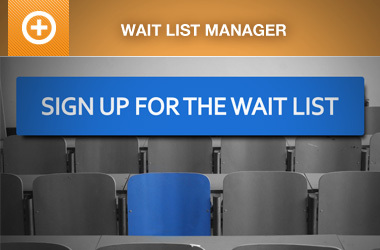 What film festival ticketing software would be complete without after event follow-up and re-marketing features? That’s why we’ve made it possible for Event Espresso to be integrated with a very popular mailing list manager, called Mailchimp. If the Event Espresso Mailchimp add-on is installed on your website, whenever one of your film festival enthusiasts registers for any of your shows, their contact information is automatically added into a specified mailing list in Mailchimp. That way, when your ready to post your next event, you can email all of the people who’ve bought tickets in the past about any upcoming events. Best of all we do not charge you per-ticket fees – a hot button issue for event managers! If you have not yet chosen an online ticketing software for your film festival, know that our yearly subscription based pricing can potentially generate additional revenue for you. And if your current film festival ticketing system doesn’t provide the tools mentioned throughout this post, please contact us at your convenience. Unlike other film festival and event ticketing companies, who hold on to most of your ticket sales money until after the event, Event Espresso allows you to choose your own payment processor, so the money goes straight to you as soon as tickets are sold – just like a product sale. That gives you the money you need to cover bills, pay for venue rental, and even earn interest. If your current film festival ticketing system doesn’t provide the tools mentioned throughout this post, please contact us at your convenience, or post to the pre-sales forums and we’ll do our best to help explain how it can work for you.